Don't get me wrong. I have been known to eat ice cream sandwiches here in the US. In fact, in middle school, I ate them for lunch. Not after lunch but FOR lunch. I used my lunch money for a bag of chips and an ice cream sandwich with chocolate chips in the ice cream (strangely, they did not call it chocolate chip ice cream…). I was on a health kick. But there have always been things that puzzled me about the ice cream sandwich. What are the holes for? Why, no matter how long you freeze it, does the "cookie" always remain soft? These my friends are the mysteries of life. One can go through life in ignorant bliss thinking that the picture above is the one and only ice cream sandwich available to man. Until you go to Sicily. The Sicilians are a curious people. They are Italian, but not completely. Their markets feel like Arab Bazaars. Their dialects are filled with influences from Arab, Greek, Spanish languages. They seem to live a life of decadent elegance. In Sicily, an ice cream does not come in a cone or a cup. It comes in a sandwich, quite literally. On a roll called a brioche (a name which is very French and not at all Italian). Yes, the Sicilians serve the most decadent of all gelato - Gelato con Brioche con…..wait for it…..Panna (whipped cream)! Not only do they stuff the gelato into a buttery freshly baked roll, they then slather a whole lot of whipped cream (the real thing) on top. And before you turn up your nose, I encourage you to give it a try. I have been attempting to recreate the Italian ice cream sandwich at home but have failed for a number of reasons. The brioche are difficult to find. I did purchase some and had great hope but they were too dense and not fluffy enough. Brioche french toast is on the menu this weekend. The gelato has not been of the quality I had hoped. If anyone knows of a true gelateria in New England,do let me know. While some are good, they are just not quite right. I am not strolling along the waterfront in Sicily, gelato brioche in hand as the sun warms my face. Sorry, it makes a difference. 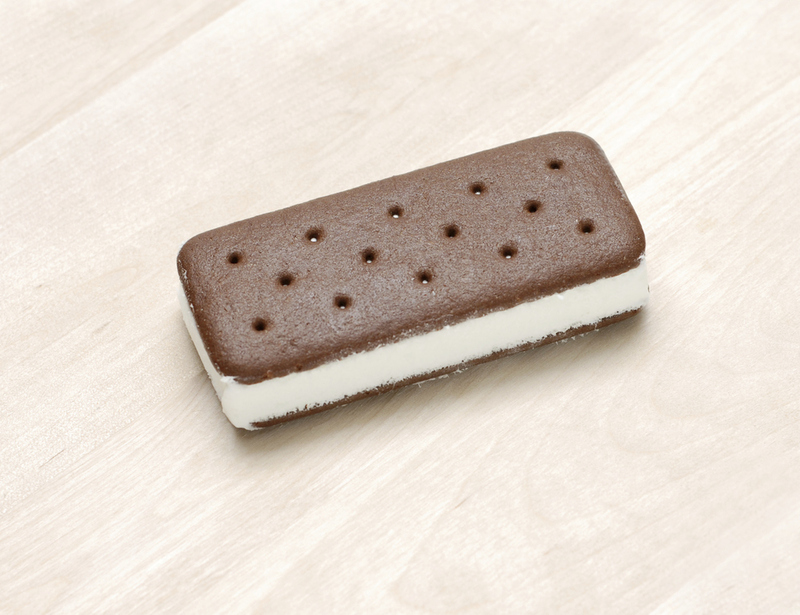 Here is a photo of my ugly ice cream sandwich. I will post a picture of the next attempt. In the meantime, do note that I had a bit of success when I toasted a mini brioche and layered it in a bowl with the gelato and whipped cream. But it wasn't at all the same. So until I do find the answer and we can revolutionize the ice cream sandwich industry here in the US, my advice is this: Go to Sicily.